It's been proven that a plant-based diet is good for your weight, health, budget, and the environment, but the proof hasn't come with a game plan--until now. In addition, in The Plant-Based Journey, Muelrath explains how exercise and your mindset support dietary change, and she also shares more than 20 recipes along with meal plan templates and ready-in-minutes meals that will have you pulling together delicious and satisfying meals with ease. Whether you're a plant-based newbie looking to shed pounds or a seasoned vegan in search of fresh inspiration and navigational skills, The Plant-Based Journey is your essential, definitive guide--for a healthier, trimmer you. 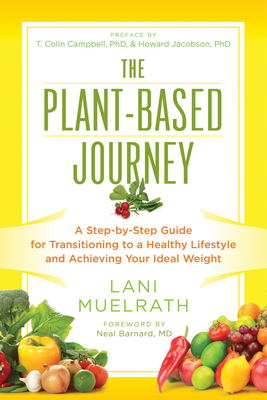 Award-winning Lani Muelrath, MA, is a professor and instructional design expert specializing in plant-based living, fitness, and weight management. She is published in prominent magazines, blogs, and newsletters, and has recently been featured on ABC-TV, Prevention Magazine, USA Today, and The Saturday Evening Post. Lani starred in CBS TV's fitness show, Lani's All-Heart Aerobics. Lani serves as presenter and celebrity coach for the Physician's Committee and the Complete Health Improvement Project. She is certified in Plant-Based Nutrition from Cornell University and maintains multiple teaching credentials in the State of California, as well as an Advanced Fitness Nutrition Specialist credential with the National Academy of Sport Medicine, along with multiple other certifications. Author of Fit Quickies: 5 Minute Targeted Body-Shaping Workouts, Lani counsels a variety of clients throughout the world from her northern California-based private practice emphasizing successful transition strategies to healthy plant-based living.